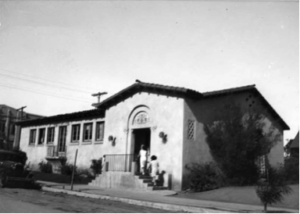 The first Logan Heights Library branch opened in 1914 in a rented building at 28th Street and Marcy. 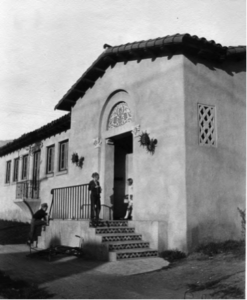 It opened largely due to efforts by community members and Mabel O Farrell, Principle of Logan Elementary School, to establish a library for the Logan Heights neighborhood. As community use of the library grew, it moved locations twice; first in 1917 near Logan Avenue and 26th Street, and secondly (and permanently) in 1927 to the corner of Logan Avenue and 28th Street.1 The library was built at a cost of $17,840 and spanned 3,967 square feet.1 The library and its services were used heavily by the Logan Heights community, with 65% of its collection specializing in juvenile materials due to its proximity to the Memorial Academy Middle school and Logan Elementary school.1 The library’s collection consisted of 43,662 titles with an emphasis in a Spanish language collection that served the heavily Hispanic population that constitutes 68% of the residents Logan Heights.1 The library enabled Logan Heights’ residents to access important programs that promoted family and computer literacy, such as access to the Internet and word processing programs that assisted with homework assignments and career development.1 In its prime, 9 elementary schools, 1 middle school, 1 alternative school, 1 adult continuing education center, 3 preschools, and 3 recreation centers were served by the Logan Heights Library. In the words of Alina Rosas, the first Logan Heights library was “not what she grew up knowing the library could be”. 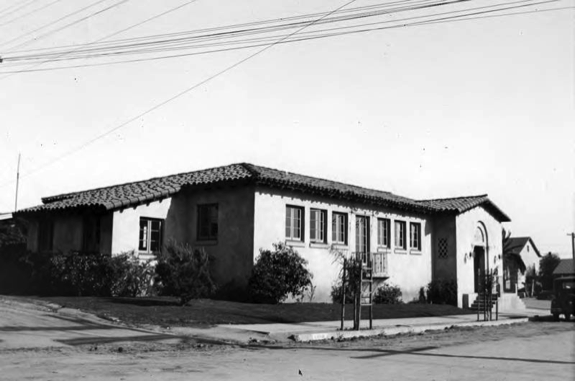 A major resource for a growing community, the original Logan Heights library provided crucial services to children, families, and individuals within the neighborhood. The Summer Reading Program, a program implemented across all San Diego branch libraries, was one of the most popular programs utilized by the Logan Heights Library. From June 15-August 15th every summer, the library would provide programs that encouraged reading, literacy, and fun for children in the community. The program aimed to get kids in Logan Heights to develop a positive relationship with reading, and in some cases, raise their reading levels so they could continue to advance within the public school system. The library would use money fundraised by the Friends of the Logan Heights Library to purchase incentives and prizes to give to the children who maintained the highest reading levels over the summer. Prizes included coupons for free children’s meals from Hometown Buffet, McDonald’s vouchers, and Rite Aid ice cream vouchers. As an extra activity, those children who achieved the highest reading levels were treated to a special trip by the Friends of the Logan Heights Library; for example, one year the children were taken to see The Nutcracker ballet. Partnerships for Change, another major program utilized by the Logan Heights Library, provided $20,000 for promotion materials, printing, travel, and book purchases. This grant enabled the library to purchase a large number of books in Spanish, which was essential for a library serving a predominantly Hispanic population. The money granted by Partnerships for Change was instrumental in allowing the library to serve a rapidly expanding population that needed the resources the Logan Heights library could provide. 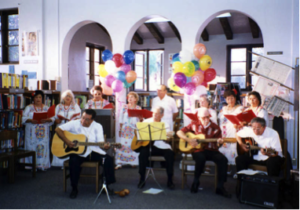 La Roudalla del Paraiso performance during the Logan Heights Library 65th anniversary celebration, October 14, 1992. The Logan Heights Library also served as a safe space within the community, providing information and resources for people seeking help with immigration and emergency food, shelter, and clothing services. In the early 1990’s, Alina Rosas and her supervisor, Juan Ortiz, worked to help patrons make appointments with immigration services who could not afford to hire a lawyer to do so. The resources and staff of the original library were instrumental for many community members taking the first step towards achieving amnesty and citizenship. The original Logan Heights library is a landmark that embodies the resistance taken up by a community that has historically lacked the resources awarded to other areas in San Diego. The library is representative of the independence of a community that values knowledge, opportunity, family, community, and education. The building, still standing today, remains a symbol of the love, strength, and hard work that the people of Logan Heights have embodied since its birth. The legacy of the original Logan Heights library lives on today through the staff at the new library on 28th Street, and through the original building that remains standing to this day. Special thanks to Connie Zuniga and Alina Rosas for sharing their experiences and memories of the original library.